Watford produced a stunning display to end Millwall's 10-month unbeaten home record in emphatic fashion. John Eustace bundled in Don Cowie's corner and Jordon Mutch lashed home as the Hornets raced into a 2-0 lead. Marvin Sordell tapped in a third before Adrian Mariappa headed in another Cowie corner for the rampant visitors. Liam Trotter pulled one back for the Lions but Danny Graham then fired into the top corner and Martin Taylor headed in Cowie's cross to complete the rout. It capped a humiliating afternoon for Millwall boss Kenny Jackett in his first match as a manager against the side he made 428 appearances for in the 1980s. The Lions kicked off in fourth place in the Championship and on the back of a 21-game unbeaten run at The Den, but ended the day being leapfrogged by the clinical Hornets. Watford had the hosts on the back foot from the first whistle and were rewarded when they went ahead in the seventh minute. Cowie swung in a corner which flew across a crowded penalty area and found Eustace, who diverted the ball into the net with his thigh at the far post. The Lions defence looked shell-shocked and Watford took full advantage, doubling their lead six minutes later. Birmingham loanee Mutch saw his initial shot blocked but was allowed to have another crack and lashed the ball past David Forde for his first goal for the Hornets. Steve Morison came agonisingly close to halving the deficit when his angled half-volley crashed against the underside of the crossbar and bounced clear. Lions skipper Paul Robinson then headed James Henry's corner goalwards but Watford's England Under-21 international Scott Loach made a fine save. And Watford got a third on the stroke of half-time when Sordell grabbed his fourth goal in three games, prodding away the rebound after his first shot was blocked with Millwall's defence dithering again. The hosts went further behind when Cowie sent in another corner and centre-half Mariappa powered his header past Forde. Millwall finally got on the scoresheet two minutes later, Trotter finishing well after latching on to Scott Barron's cross. But an unlikely comeback did not materialise and the tireless Graham grabbed a fifth for Watford when he rifled his shot past Forde before Taylor headed the sixth a minute from time. 90:00+2:25 The referee blows his whistle to end the game. 90:00+0:26 The assist for the goal came from Don Cowie. 90:00+0:26 GOAL - Martin Taylor:Millwall 1 - 6 Watford Martin Taylor finds the back of the net with a headed goal from close range. Millwall 1-6 Watford. 89:36 Outswinging corner taken by Don Cowie from the right by-line. 88:52 Corner taken by Don Cowie from the right by-line, clearance by Steve Morison. 87:32 Jordon Mutch produces a left-footed shot from deep inside the area which goes wide of the left-hand post. 82:38 Inswinging corner taken by Danny Graham from the left by-line, clearance by Paul Robinson. 82:05 Troy Deeney takes a shot. Save by David Forde. 76:38 GOAL - Danny Graham:Millwall 1 - 5 Watford A goal is scored by Danny Graham from deep inside the penalty area to the top left corner of the goal. Millwall 1-5 Watford. 75:51 Inswinging corner taken by Don Cowie from the left by-line, Steve Morison manages to make a clearance. 75:51 Substitution Tamika Mkandawire comes on in place of Nadjim Abdou. 74:21 Steve Morison challenges Adrian Mariappa unfairly and gives away a free kick. 74:08 Scott Loach takes the free kick. 74:08 Booking Steve Morison booked. Correction - 72:23 Steve Morison takes a shot. Effort on goal by Chris Hackett from just inside the area clears the crossbar. Save by Scott Loach. 72:23 Steve Morison takes a shot. Effort on goal by Chris Hackett from just inside the penalty area goes harmlessly over the target. Scott Loach makes a save. 69:38 Substitution Lee Hodson joins the action as a substitute, replacing Andrew Taylor. 68:46 Don Cowie takes a shot. 67:22 Substitution Troy Deeney on for Marvin Sordell. 64:25 Outswinging corner taken by Chris Hackett from the right by-line. 62:01 Inswinging corner taken by Chris Hackett, clearance by Jordon Mutch. 59:01 Substitution Will Buckley leaves the field to be replaced by Stephen McGinn. 57:14 Jordon Mutch gives away a free kick for an unfair challenge on Steve Morison. Shot on goal comes in from Scott Barron from the free kick, save made by Scott Loach. 55:08 Assist by Danny Schofield. 55:08 GOAL - Liam Trotter:Millwall 1 - 4 Watford Liam Trotter gets on the score sheet with a goal from deep inside the penalty box to the bottom right corner of the goal. Millwall 1-4 Watford. 54:42 Booking Marvin Sordell is cautioned by the ref for time wasting. 53:49 Assist on the goal came from Don Cowie. 53:49 GOAL - Adrian Mariappa:Millwall 0 - 4 Watford Adrian Mariappa grabs a headed goal from inside the six-yard box. Millwall 0-4 Watford. 52:18 Foul by Steve Morison on John Eustace, free kick awarded. Free kick taken by Scott Loach. 50:29 Corner taken by Don Cowie from the right by-line, save by David Forde. 49:59 Free kick taken by Adrian Mariappa. 49:59 Booking Scott Barron shown a yellow card. 49:35 Foul by Scott Barron on Will Buckley, free kick awarded. 48:24 Free kick awarded for a foul by Theo Robinson on Adrian Mariappa. Indirect free kick taken by Scott Loach. 45:01 Substitution Chris Hackett joins the action as a substitute, replacing James Henry. 45:01 Substitution Theo Robinson comes on in place of Neil Harris. 45:00+1:33 GOAL - Marvin Sordell:Millwall 0 - 3 Watford A goal is scored by Marvin Sordell from inside the penalty box to the bottom right corner of the goal. Millwall 0-3 Watford. 45:00+0:21 The ref blows to end the first period. 40:45 Free kick awarded for an unfair challenge on John Eustace by Steve Morison. Free kick taken by Scott Loach. 36:52 Will Buckley fouled by Scott Barron, the ref awards a free kick. Lloyd Doyley takes the direct free kick. 33:52 James Henry takes the outswinging corner, Paul Robinson takes a shot. Save made by Scott Loach. 31:08 Steve Morison takes a shot. 30:30 Free kick taken by Scott Barron. 30:30 Booking Booking for Lloyd Doyley. 29:55 Lloyd Doyley challenges Scott Barron unfairly and gives away a free kick. 28:52 Inswinging corner taken by James Henry from the right by-line, clearance made by Don Cowie. 27:23 Martin Taylor concedes a free kick for a foul on Steve Morison. James Henry restarts play with the free kick. 25:35 Unfair challenge on John Eustace by Liam Trotter results in a free kick. Scott Loach restarts play with the free kick. 23:32 Marvin Sordell takes a shot. Save made by David Forde. 18:31 Corner from left by-line taken by James Henry. 18:04 Corner taken right-footed by Darren Ward, clearance made by John Eustace. 16:50 Corner taken by Don Cowie from the left by-line, save made by David Forde. 13:00 GOAL - Jordon Mutch:Millwall 0 - 2 Watford Jordon Mutch finds the back of the net with a goal from close in to the bottom left corner of the goal. Millwall 0-2 Watford. 6:26 Assist on the goal came from Don Cowie. 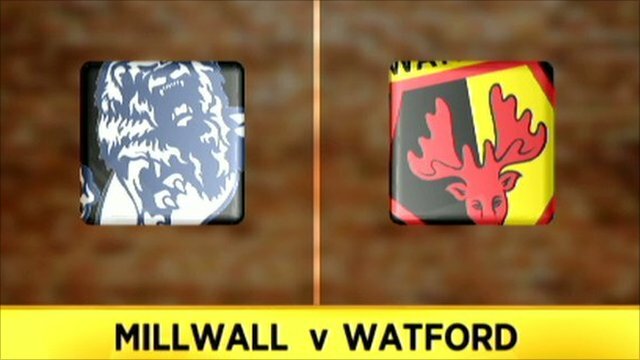 6:26 GOAL - John Eustace:Millwall 0 - 1 Watford Goal scored by John Eustace from close range to the top right corner of the goal. Millwall 0-1 Watford. 3:00 Neil Harris is ruled offside. Indirect free kick taken by Scott Loach. 2:37 Outswinging corner taken from the right by-line by Don Cowie. Correction - 2:09 The assistant referee signals for offside against Neil Harris. Scott Loach takes the indirect free kick. 1:55 Danny Graham is ruled offside. David Forde restarts play with the free kick. Correction - 1:00 Unfair challenge on Neil Harris by Adrian Mariappa results in a free kick. James Henry restarts play with the free kick. 0:00 Free kick awarded for a foul by Adrian Mariappa on Neil Harris. James Henry restarts play with the free kick.